A file photo of a SpaceX Dragon spacecraft atop its Falcon 9 rocket ahead of a launch to the International Space Station from Space Launch Complex 40 at the Cape Canaveral Air Force Station in Florida. SpaceX will launch its next Dragon mission for NASA on Dec. 15, 2017. SpaceX has again pushed back the launch of a used Falcon 9 rocket and Dragon capsule filled with NASA cargo — this time to no earlier than Friday (Dec. 15) — for extra inspections and cleaning after engineers detected particles in the booster's second-stage fuel system. A SpaceX Falcon 9 booster and Dragon spacecraft — both making their second flight — were scheduled to launch a delivery mission for NASA from Cape Canaveral Air Force Station in Florida on Wednesday (Dec. 13). But the need for more ground-system checks forced SpaceX to push the launch to Friday at 10:35 a.m. EST (1535 GMT). "SpaceX is taking additional time for the team to conduct full inspections and cleanings due to detection of particles in 2nd stage fuel system," NASA officials wrote in a status update. "Next launch opportunity would be no earlier than late December." It is the second launch delay in two days — and third overall — for the SpaceX mission, which is called CRS-13. (CRS is short for commercial resupply service.) The mission was originally scheduled to launch Dec. 8 . Last week, SpaceX delayed the flight to Tuesday (Dec. 12), then pushed it back another 24 hours to Wednesday late Monday night. This mission will be the 13th delivery flight to the International Space Station for NASA by SpaceX under its resupply contract with the agency. The Dragon spacecraft will deliver nearly 4,800 lbs. (2,177 kilograms) of food, supplies and science gear — and maybe even some Christmas presents — for the station's astronaut crew. 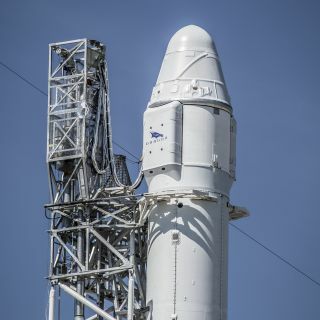 In a first for SpaceX (and NASA), the mission will launch using a previously flown Falcon 9 first-stage booster, as well as a used Dragon space capsule. SpaceX has flown a used Dragon cargo ship for NASA once before (during a June delivery mission) and has launched three used Falcon 9 boosters to date (all within this year). But SpaceX has never flown a used Dragon and Falcon 9 booster together. The company has landed 19 Falcon 9 boosters as part of its ongoing reusable rocket program to reduce the cost of spaceflight. The upcoming mission will also mark SpaceX's return to launches from Cape Canaveral Air Force Station following a September 2016 explosion at the launch site. SpaceX spent the last year conducting repairs and upgrades to the launch site. In the interim, the company flew Falcon 9 missions from the nearby Pad 39B at NASA's Kennedy Space Center — which SpaceX leases for commercial launches — as well as a West Coast launchpad at Vandenberg Air Force Base in California. Editor's note: This story has been updated to correct the date of SpaceX's next Falcon 9 launch attempt. It is Friday, Dec. 15, not Dec. 13.